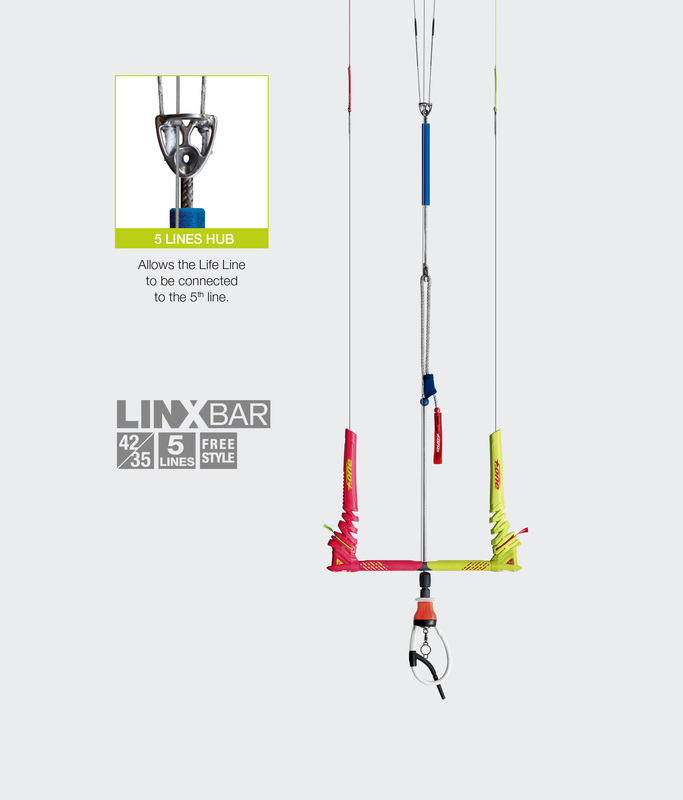 The LINX bar is our brand new updated control system for 2018! We’ve taken all the best bits of the Monolith Bar and added some great features to create the ultimate connection to your kite. 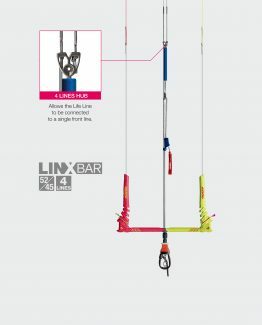 The LINX bar is available in (42 – 35 cm). Our new integrated floats on the rear line not only offer a cleaner look; they also house the mechanism to adjust the size of your bar too. A new One Line Flag Out safety system features this year and is now the standard for all F-ONE kites. There’s a high-quality corrosion proof Inox steel hub on the front lines that allows one line to slide. The first 6m of the front lines are larger in diameter for durability, and there is a stopper to prevent the bar from travelling too far away from you when the safety is engaged. We have also added a manual swivel on top of the chicken loop this year; it uses a high-quality ball bearing and is easy to rotate even when powered. This allows you to untwist your front lines after performing rotational tricks and is a feature every rider is going to fall in love with! 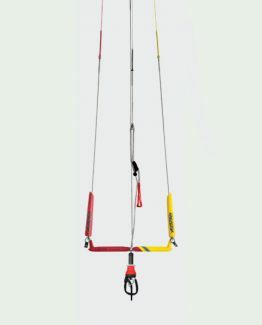 The Lifeline safety connection has an added swivel, so there is no danger of twists affecting the release of the kite, and the same goes for the leash too. The safety can be set up in suicide mode for freestyle riders while still retaining full functionality when the chicken loop is released as the loop can slide through the Lifeline safety connection with ease. There’s a new Inox steel ring on the front lines; riders can choose to run the front lines through this ring to give the kite a short V on the front lines. 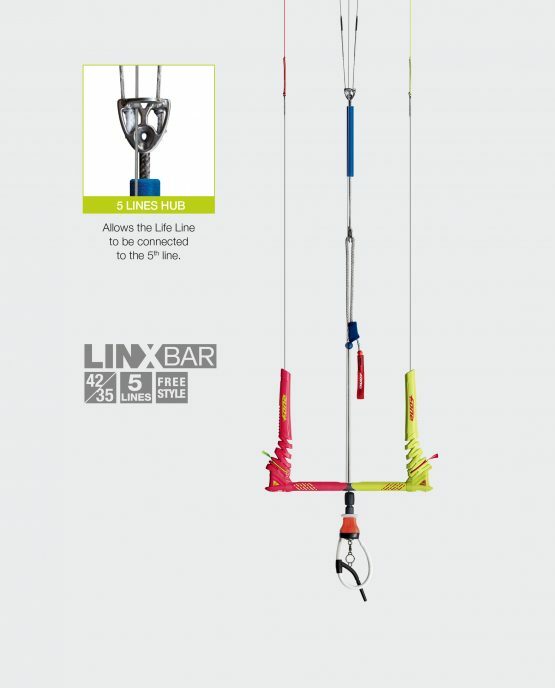 Or you can run the lines outside of this ring to have a full front V. Kites like the Furtive perform better with the full front V, while the Bandit flies better with the short V. This feature of the bar means you only need one kite bar regardless of your quiver of kites. This bar also comes with a wide chicken loop to make hooking in and out easy. The LINX bar features a smaller diameter to make it comfier in your hands and reduce fatigue and, of course, we have new fresh colours for 2018!